NICE stands for the National Institute for Health and Care Excellence. It is a little known fact that it started life as the National Institute for Cost Effectiveness, before rapidly transforming into the National Institute for Clinical Effectiveness, then the National Institute for Clinical Excellence. As you can see it changed again, and now it should be NIHCE, but we do so like our acronyms also to be words. A life of simple puns is the life for me. I was involved with NICE early on; I set up their first website for them, before being rather rudely elbowed aside. Naively, at the time, I thought the underlying concept of NICE was sound. An attempt to try to work out which medical interventions both worked, and also provided good value for money. This would bring rational thinking to the complex and difficult world where limited resources have to be rationed in some way. Clearly, I knew that the Government of the time had basically set NICE up to act as a barrier to attacks by the public and a restless media. As everyone knows, the minute you refuse treatment to a young child for, say, cancer, the front pages of the newspapers light up in outrage. By getting NICE to say no, the Government could cower behind NICE’s decisions in relatively safety. For, as we all know, even if a treatment costs two million, and the chances of success are one in a hundred, most people simply adopt the ‘pay anything, do anything, to save this child.’ mode. The counter argument, that I could use that two million to save fifty lives elsewhere rarely gets an airing. ‘A child is dying….’ Is an argument that usually shuts everyone else up pretty quickly. You can look a tad heartless, very rapidly. Of course this rather destroys the entire point of NICE whose decisions are simply bypassed, and also makes it clear that people with cancer are considered far more valuable than anyone else. ‘Dying of motor neurone disease, or heart failure, or kidney disease…. Sorry mate, no money. We have spent it all on cancer drugs.’ The NHS, for a system so terrified of discrimination, against anyone, on the grounds of anything, it seems strange to positively discriminate in favour of people with one form of disease vs. another. Oxford entrance exam, discuss. Don’t worry, it has long been clear that vote winning irrationality will crush evidence and judgement at every turn. Anyway, I am getting far away from the point of why I set out to write this blog. NICE, like most organisations started out with a fairly clear aim. To look at medical interventions, then decide which ones provided enough benefit, at reasonable cost, to be funded. But it has grown and grown, or perhaps I could say that its role has metastasised. It now has become – primarily – a guideline generating monster. Every couple of weeks NICE will drop six hundred pages of ‘how condition x must now be treated,’ onto the medical profession. Dense and verbose and boring and very, so very very, long, and then what? Are they rules, must they be followed? This all becomes very opaque. Last year NICE decided (super short summary) that everyone with a risk of a cardiovascular event greater than 10%, over the next ten years, should be put on a statin. There was much debate, and the BMA (British Medical Association) voted – unanimously – that these guidelines should not be followed. Did this make any difference? No. Did it make any difference that the Local Medical Committees (that represent all GPs) at their annual conference voted unanimously against these guideline? No. What are NICE doing about the fact that, at least, two thirds of GPs are completely ignoring these guidelines. Nothing…yet. No debate, no discussion. Nothing. They know that, over time, their guidelines will solidify into something that becomes, effectively, mandatory. Can you discuss anything with them? No, you cannot. A number of people, including me, wrote an open letter to NICE criticising the guidelines. NICE deigned to read our letter, they reviewed their own decision making, and they decreed that they could find no errors in what they had done. They were good enough to inform us of this fact citing the eminence of their ‘experts’ whose greatness and wisdom passes all mortal understanding. Then what could we do? Nothing. NICE, you see, are both the prosecution and the defence council, the Judges and the Supreme Court all wrapped in one. There is no higher authority. There is no executive, no Ombudsman. The only authority that can review a NICE guideline is… NICE. Which means that, for example, when a study comes out showing that long term statin use increases the risk of Parkinson’s disease by 230% (Relative Risk increase)1, NICE can feel free to totally ignore it. In fact, when confronted with this study they said it was ‘nonsense.’ An interesting response, I felt, before they had even seen it. Ignoring NICE’s view that this study was nonsense, I did a little calculation based on this paper. It went something like this. Parkinson’s disease affects about 1 in 250 people. It is not rare, but not that common. The NICE guidelines on statins mean that, at the very, very, least, 50% of people should take statins from the age of fifty, for the rest of their life [how many actually will is a moot point, but stay with me here]. If 50% of people take statins and the risk of Parkinson’s increases by 230% it follows that the 1/250 lifetime risk of developing Parkinson’s becomes an extra 2.3×1/250/2 = 0.0046. IN short, the NICE guidelines will result in an extra 0.0046% of the population developing Parkinson’s. On the face of it, this may not seem like a massive problem. But the population of the UK is around sixty million, and if we multiply sixty million by 0.0046, we get 276,000. That is more than a quarter of a million people who will develop Parkinson’s disease who would not otherwise have done so. Just from a purely economic basis, this would be hugely costly. Like all things in medicine, it is difficult to establish exactly how much it costs to look after a Parkinson’s patients, but in the UK it has been estimated as between £3,500 to £10,000 per year2. (Up to $100K in the US, I have read). Now you can argue these figures, and I am sure that NICE would – were they ever to engage in this debate. They will say that Parkinson’s is less common than this (I have seen both higher and lower estimates), they will argue the exact costs, they will bore you into submission with NPVs and suchlike. You can argue all you like on the minutia, but if this paper is right, and I see no reason to suspect it is not, the NICE guidelines will inevitably result in hundreds of thousands of extra people developing Parkinson’s disease, at a cost of billions to the NHS. Leaving aside the added suffering and Disability Added Life Years (DALYs) this will bring. Now this represents a massive and very major issue. If NICE were to take this research seriously, they would have to reconvene and review the evidence, and work out the ‘new’ costs and harms to patients, and perhaps they would have to reverse their guidance. The simple truth is that there is too much at stake here for NICE, and the entire spider’s web of interconnected reputations, and status, and opinion leaders, and money, for NICE to ever reconsider their guidance on statins. Facts and evidence are puny weapons in this battle. Next week, dear reader, we shall examine the economic consequences of statins increasing the risk of type II diabetes by 46%. Get ready for some pretty gigantic figures. The zeros, they shall stretch as far as the eye can see. 1: Huang X et al: ‘Statins, Plasma cholesterol, and risk of Parkinson’s Disease. A Prospective study.’ J of Movement Disorders (epub ahead of print). This entry was posted in NICE on March 13, 2015 by Dr. Malcolm Kendrick. Surely you mean acronym, rather than anagram? On another note, any idea when your new book gets published? I purchased it in December 2014. Am still waiting for it. Emailed publisher twice. No response. Live in Australia. Um, sorry. I just wrote the thing. I will forward your query to the publishers. It is half published now. Amazon next week. Hi DS – I ordered my copy from the publisher’s website more recently than you and it was delivered within a week or two, here in NZ. Can’t remember exactly, but I remember thinking how prompt it was. 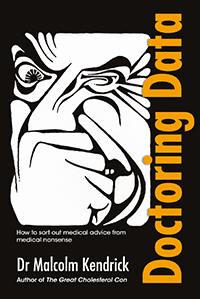 I ordered Dr Kendrick’s new book at the end of February from the publisher’s website – where it says books are in stock and will be sent out within 48 hours, but I’m still waiting for it! I’m in the UK. So much for the British postal service. Strangely I never received an email acknowledgement for my order either, although the Paypal transaction has gone through…..
Well, they can ignore you and we’ll ignore them. Seems fair. I suspect that there are many out there who were similarly fooled; I confess to being one of them! Dense and verbose and boring and very, so very very, long, and then what? Can you discuss anything with them? No, you cannot. I also wrote to them with references. Their response was “Join a stakeholder group”. When investigated, these turned out to be Big Pharma companies or charities pimping for Bbig Pharma. …. That is more than a quarter of a million people who will develop Parkinson’s disease who would not otherwise have done so. And what about Alzheimer’s? In 1960 about 2% of the 85+ year-old group had it (1 in 50); current for this age group (85+) it is expected to be 50% (1 in 2). And that is in the SAME age group, so age is not a factor. This study claimed that “Midlife Serum Cholesterol and Increased Risk of Alzheimer’s and Vascular Dementia Three Decades Later” (The title) but if the row labels in Tables 2-4 (cholesterol blood levels) are changed to US guideline treatment this does not change numbers or statistics but certainly changes the interpretation. A further flaw is that the actual treatments are NOT AVAILABLE (ie redacted from the patient records). Question: would a medical insurance company go against Govt guidelines? I do not believe so! Doing a Chi-square analysis on data in Table 2, I found that over 3 decades, cholesterol lowering treatment (statins from about 1990 on) that there was a ~58% increase in AD & VaD in the high TC group (cholesterol lowering treated patients). Seneff has shown that statins are associated with ALS and Parkinson’s – ignored; Golomb has shown association with self-harm, suicide etc. Even the data inserts acknowledge poolyneuropathy and memory loss but it seems that NICE and its “experts” cannot or will not understand the link. This paper is never referenced in statin papers that claim statins “help” in AD. Yes, I too remember thinking it sounded nice! The best antidote is to think of the committee of politicians spending weeks fitting a name to a sweet sounding acronym! Incidentally my reply was supposed to go to Dr K.
But the uninformed don’t necessarily have that luxury I agree. Just ‘been there done that’. I recently received a letter from my GP surgery informing me that I ‘needed’ to come in for a BP measurement and to ‘telling’ me to have bloods taken for routine testing. I have politely written back to inform them that I am currently in good health (who knows? the tests used certainly don’t demonstrate anything) and that I no longer wish to have ‘routine’ testing, but will contact them should I need medical advice. I have not heard back, but on balance I would rather trust to millions (hundred of millions in the case of some genetic adaptations) of years of evolution that has enabled the body and mind I inhabit to maintain a certain homeostasis in the face of how I treat it, rather than allow a bunch of ignorant and arrogant chemists – more akin to demented hammer-wielding bonobos in a swiss-watch factory – to require that my GP suggests I poison my delicate machinery. One added bonus is that I will be able to continue to answer the holiday insurance companies’ questions regarding my knowledge of any ill health conditions (mostly made up by the drug pushers and their shills) in the negative. Please don’t be unkind to bonobos. Yes Malcolm, and anyone willing to take even a minute increased risk of developing Parkinson’s will likely never have nursed anyone in the end stages of the awful condition. It is hideous, and I for one, am so pleased that I gave up taking Simvastatin 40mg a couple of years ago, even though I was unaware of such a connection at the time. I shudder at the thought that had I collected the ( incorrect) prescription for 80mg that someone had negligently written out for me, I might well be adding Parkinson’s to my list of ailments by now. You mention Motor Neurone Disease….I watched my father succumb to the condition at the age of 64, 2 years after diagnosis, and I believe the 2 conditions are almost equaly as bad for the unfortunate suffers. I want there to be much more understanding of the outcomes and costs associated with conditions, and in particular, those that are now know to be brought on by inappropriate medications. Perhaps Uncle Gideon might get his abacus out next week, and sort something sensible out regarding proper use of NHS funds. Now I really am looking for miracles!!!!!!! I am just recovering, with the help of a few drops of real Scotch whisky (Ardbeg 10 years), from the extraction an infected tooth root. What surprised me when I got back home and opened the little box it was placed in was the incredible stench that came out. Maybe it is the same thing with NICE and this is why it can never be uprooted. People would suffocate and no Scotch in the world could help them. If only getting (re)elected were not so utterly incompatible with doing anything rational or useful. A NICE cosy little “scratch my back” clique of ………. (unprintable). So shocking I would find the whole outrageous situation impossible to believe had I not been following all this. As a rational person It strikes me that NICE should be representing doctors and not totally ignoring them and dismissing their opinions. We need to destroy this monster. The question is how? Seriously, I am more and more losing my hope that ‘medicine’ could ever recover into a decent Hippocratic state. My dystopic view of the world is growing and the “Brave New World” is more real than ever for me. Perhaps it is just before you are to take your final step over the edge of the cliff that you might be able to gather strength to ponder about the depth of the delusions we are subjected to from above. This has now happened to a relative of mine who was recently found to be seriously ill in cancer and who has for years been quite hostile to my ‘low carb’ preaching. Anyway, this attitude has all of a sudden completely turned around especially after he now met with a nurse who also suggested that he might try a ‘low carb eating’ as a means of reducing his excess weight and reduce the ‘inflammatory state’ facing a comprehensive surgical treatment. Well can change be possible after all? Please – give me hope! Great article to say the least, Dr. Kendrick. My mother’s neurologist says she has dementia with “Parkinsonian” features, whatever that means. Then he thought maybe Alzheimers. I just don’t get it. After twelve years of statins, and only less than two years off, I would have thought she might be a little better. I think it is the twelve year stint in statin prison that got her. Parkinson’s, it is said, is a disease of exclusion. I would like to add my take on that medical characterization of Parkinson’s. To me, it means that if you exclude statins from your life, you are likely NOT to suffer with it. NICE? By the way…What’s so nice about ’em anyway? I say, that’s a joke son, I say that’s a joke!!! Hello Malcolm. I had great hopes for the organisation that was the National Institute for Clinical Excellence. My (possibly faulty) understanding was that it would be a repository of best clinical practice, which would be referred to by any clinician wanting to evaluate and compare different approaches to clinical care. You will surely remember the NICE technology appraisal guidance for statins (TA94) now transmogrified into clinical guidance 181. My recall of the list of stakeholders for that, particular technology appraisal guidance, was that a number of statinators were on that particular committee as stakeholders. I won’t ask where the patients were being represented. Not exactly an arm’s length relationship with the prescribers eh? Our love of fine acronyms also begat the Commission for Health Improvement (CHI). It was short lived and ran from around 2001 if I recall it correctly. A meeting of CHI was planned in a hospital in which I was working. It was advertised and the official poster campaign definitely referred to CHI by the acronym CHimp. Written with the C and the H in bold capital letters and the imp in smaller italicised text. Prescient… or just some bored civil servant having fun on slow day down at the Department for Health. Thanks very much. Your contribution adds to Dr K’s very well but leaves me wondering what really is going on. Concern for patient health does not seem to be at the top of the list. Maybe, the 225,000 dying each year in the US (which would suggest about 40,000 in the UK) from iaotrogenic causes is simply being accepted a “business cost” in the same way as Big Pharma treats US $billion fines. Thanks for your comment Mike. I think now may be a time for some shameless self promotion. I have run (and continue to run) an e-petition that was the seed of a paper which I had published and sent to all of the major so-called pharmaco-vigilance bodies in the world. (None have replied) The WHO had also not replied. Concern for patient health is not a concern at all… as far as I can tell. In just 351 document cases of statin side effects which had been self-reported, I recorded under the heading of neurological adverse effects: 18 cases of Amyotrophic Lateral Sclerosis/Motor Neurone Disease), 1 case of multiple system atrophy, 1 case of Alzheimer’s disease, 8 cases of Parkinson’s disease, 1 case of progressive supra-nuclear palsy, 1 suspected case of chronic inflammatory demyelinating polyneuropathy. All of the conditions listed are relatively rare and yet 29 reports of major neurodegenerative disorders were reported. One conclusion I drew was that for 18 cases of ALS/MND to be reported, the sample size should have been about three million six hundred thousand; given the incidence statistics for ALS/MND. Just 351 useful clinical information reports was the sample size for my paper. It is very clear to me that statins have the ability to affect the neurological system. I entered into a long and futile conversation with a doctor at the MHRA but she refused to believe that stains can be anything but beneficial. I had a shorter but equally futile dialogue with the FDA. NICE and the British Heart Foundation were dispiriting experiences and my current position (present company excepted Malcolm) is that if one wants to stay healthy, then you must keep away from the medical profession. I have signed the petition and would encourage all followers of Dr Kendrick to do likewise. and many thanks for the links. I note that you too had problems with the “agencies” that were set up to protect the general public from dangerous and ineffective drugs. Prof. Gotzsche (Deadly Medicines and Organised Crime;Chapter 11) gives many details of this. The heart failure epidemic was posted by both the US CDC and NHBLI on their websites but was rapidly removed because of the visual association with increasing sales of cholesterol lowering drugs, mainly statins. Appreciated your providing us with information on statin related side effects and deaths from Dr. Graveline. Was this a recent response? I am curious about the current statistics on statin related deaths and/or side effects. My mom was on statins for 12 years. I immediately noticed cognitive dysfunction. One day, the whole family was meeting for lunch at a restaurant we frequented. I got a call from her stating she did not know where she was. I thought she was just stressed. She gave me some landmarks and I quickly drove to her to guide her to the restaurant. She was only 3 blocks away. That was when I knew something was amiss. I had no idea at the time statins could do that to a person. It has become progressively worse. She has neurological problems, congestive heart failure, has had cataracts. Yesterday we took her to the ER as per her doctor’s advice because of severe pain after falling for the 10th time this year. She did break three ribs. Now, they think she has kidney cancer. My mother was the first in our family to take statins long term. Her health, formerly robust, is a nightmare. She hardly knows anyone but me and her caretakers. At 70 years old, she was robust, funny, fun to be with and so vivacious. She was also drop dead gorgeous and took such good care of herself. It did not have to be this way…it did not. Yes. It was on his website (spacedoc.com) and facebook. The DAP (digital analysis prints) for simvastatin runs to 55 pages and involves most of systems (e.g Heart, Nervous system etc). Another source of information is the drug’s SPC (Summary of Product Characteristics). This contains the most Open Access information on a drug held by the authorizing body. Many doctors ignore NICE’s guidelines on statins and deserve credit for putting their patients first. However, I’m concerned that this independence will disappear in time. Newly qualified doctors are less confident and more used to simply following NICE’s recommendations. In a generation we might well have few independent thinkers left and guidelines and targets will have replaced judgment. “Do you know better than NICE?” is an easy thing to throw at a doctor who ignores the guidelines. Dr Kendrick might confidently say “Yes”, but I doubt his more junior colleagues would be able to do so. After an above average blood pressure reading I was asked to see my doctor, who I regard highly. I’m fifty-four and expected statins and blood pressure medication to be prescribed. I discussed statins with my doctor and I quoted an NNT of 100 – 300 for statins. I asked my doctor how many patients would take statins if given that statistic? My doctor said no more about statins. I then asked what the NNT was for blood pressure medication? My doctor didn’t know and asked me to do some research and come back. She was very open to me making my own inquiries. “Nine thousand people were treated for raised blood pressure for five years. At the end of the study five more people were alive in the treatment arm than the placebo arm. A result so deeply unimpressive that it fitted comfortably within the possibility of it being purely a chance finding. Or, to put it another way, this study failed completely to reach the holy grail of medical studies – statistical significance. After finishing the extracts, my doctor didn’t argue, but simply pointed out that according to NICE I met the criteria for blood pressure medication. So, the evidence says it’s a waste of time, but my doctor still had to recommend it. I told my doctor that the NNH (number needed to harm) was quoted at just 12 and I could see no case for me taking this medication. My doctor accepted my decision without a qualm and made no attempt to persuade me. I could be wrong, but I think she agreed with me. It’s reasonable to assume that most patients would have simply taken the prescription. My brother did and suffered significant side effects. After finding this site and others, two months ago I abandoned the low-fat diet guidelines that were based on Ancel Keys’ flawed and selective work. I’m tempted to say ‘fraudulent’. I’d followed these guidelines for twenty years but since abandoning them, I now feel more energetic and alert. I wonder how much harm has been done by these NICE endorsed guidelines, which were trotted out again in today’s Times by Susan Jebb, although sugar was criticised. What are the implications for doctors who ignore NICE guidelines? What are the implications for patients who ignore NICE and make rational, evidence-based decisions? Will they be charged more for their insurance because of their refusal to heed medical advice? Will some be categorised as ‘difficult’? More and more doctors are “seeing the light” but they are still subject to the DIRECTIVES (they are called “guidelines” to protect the authors) and legal action (from patient or GMC) could follow. A simple solution for some is to provide a script (covers the legal aspect) which the patient can then use appropriately. My sister, following a routine blood test as she only has one kidney, was called back to the surgery to discuss her ‘cholesterol levels’. Anticipating the statin conversation (she’s 67) she asked me for information and, armed with several printouts from Dr Kendrick’s and others’ websites, she duly attended the appointment. To her utter surprise, the doctor said she was pleased she had done her own research and agreed with my sister that she shouldn’t go on statins. She also said that she herself wouldn’t take statins and her (now-retired) GP father would definitely not touch them. They discussed the fact that my sister’s son has recently qualified as a doctor and the problems that junior doctors encounter in ‘having’ to follow the guidelines until they have enough experience to decide for themselves. Fortunately there are enlightened GPs out there who are happy to have a proper discussion about the pros and cons. Conversely, a friend of mine who presented her GP with Dr Kendrick’s cholesterol book and also the DVD Statin Nation in order to justify her decision not to take the recommended statins, was almost thrown out of the surgery! Sums of public money just make people’s eyes glaze over, but I wonder if it is possible to estimate the number of people who lose their memory plus their mobility due to statins, and actually end up in a care home. Since patients in these homes are simply fed their drugs without discussion, their fate is probably permanent. How many people are caught in this awful trap? My late mother-in-law ended up in a care home with dementia which, we felt, was exacerbated or perhaps even caused by her high dose of statins that she’s had for a decade. By then her new GP agreed that they should be stopped but, sadly, by then it was too late to reverse her memory and cognitive problems. I was just wondering Dr K, do private doctors have more flexibility than NHS ones? I presume they still have to be registered by the GMC to practice, but do they have to follow the guidelines? When should we expect the effect of statins start to show up in the life expectancy figures? Statins have been around since the late 1980s. How this one factor (with increasing life span in the order of weeks rather than months) could be established I have no idea. I do wonder how the probability of 10% in 10 years relates to life expectancy (from all causes) for a 75-85 year-old. From life tables, I estimate survival for 10 years from 75 is p = 0.27 approximately but I stand ready for correction. Mike, I have had 2 wonderful years WITHOUT the darned things. I wonder if the statinators could do their algebra on that little gem. Fortunately, I keep my feathers numbered for…just such an emergency. Interesting article and I very much agree with your take on statins, but I think there might be an error in the calculation. Aren’t the Parkinson’s risk increase stats you quote only applicable to over 50’s? You have extrapolated the risk to the entire UK population. Surely the total at-risk number is ‘only’ around 38%of your total (Age UK puts the over-50s population at 22.7m)? Just read the paper on Parkinson’s that NICE ignored. Seems to me the statinators are yet again on shaky ground! (sorry it’s a serious issue, but I couldn’t resist…. and you did say you like puns ;-). In these strange times of this funny old world that we inhabit, (except these topics are mighty important) …..I pity the Prospective Parliamentary Candidate who is going to cop for my NHS questions in the next month or so…. Disillusion with the ‘Establishment’ is rife amongst anyone who thinks for themselves. Contemporary fiction mirrors this: look at ‘Ordinary Thunderstorms’ William Boyd, ‘A Casual Vacancy’ J K Rowling, ‘Other People’s Money’ Justin Cartwright, Sebastian Faulkes etc. It seems our inability to change the power-bases (and therefore the attitudes) of these monoliths of arrogance means we need communities of questioning like this one ever more than ever. I particularly like this bit, “8 out of 12 of the GDG members had involvement with pharmaceutical companies but this was declared to NICE and judged not to be specific enough to warrant withdrawal from the group.” Presumably NICE decided that themselves. Where does the (independent) Cochrane Collaboration fit into what NICE decides for their guidelines? I’m particularly interested in, for personal reasons, NICE’s guidelines for diagnosis and treatment of “Depression in Children and Young People”. I am aware that nutritional status is becoming more and more appreciated in scientific circles as a strong factor in mental illness, including depression. I wrote to NICE to ask why this wasn’t taken into account in their guidelines, particularly as it would be a cheap intervention to provide relevant dietary supplements which are suspected to be lacking in our modern diet, and have been shown to have good effect on depression in research and clinical practice. Their guidelines only provide for treatment via drugs (only Prozac is licensed for childhood depression – but makes them suicidal, furthermore NICE guidelines allow for doctors to prescribe any other antidepressants off-licence!) and psychotherapies (which take time). Dr Peter Gøtsche has a strong opinion that antidepressants should never be given to children and young people because the risks outweigh the benefits, although he believes there are no benefits anyway (from Cochrane’s reviews of all the data). NICE eventually responded and said that when they were asked to draw up the guidelines, nobody asked them to consider diet or nutritional status. They said they would keep my comments on file for when they next review the guidelines (lol – I won’t hold my breath). Incidentally, I did write to the Department of Health as well, but they referred me back to NICE. Stalemate. “Depression in Children and Young People”. May I suggest that you check Prof. Gotzsche’s book “Deadly medicines and Organized Crime”. He is a) a leader in Cochrane and b) has commented on these psychiatric drugs. The information given in this email absolutely horrifies me. I have taken 10mg Atorvastatin on a daily basis since experiencing breathlessness almost two years ago. Following every test possible to reach a diagnosis as to what was causing this problem the first diagnosis was “a stiffening of the heart, which is quite common in old age” (I am 83 years old now,) This diagnosis was finally disproven when a more senior Doctor questioned the diagnosis and ordered an angiogram, which proved that the LAD was severely blocked requiring angioplasty and the insertion of three stents in November 2013. Since taking statins I have had various side-effects which have become so debilitating that I am currently being treated by a physiotherapist to strengthen various muscles in my legs. Presently, I am waiting for a leg splint as one foot seems to have a life of it’s own,and it is an impossibility to walk in a straight line! I have the most awful neck pain, and have recently been diagnosed with borderline Diabetes which horrifies me. I know that Diabetes can suddenly show in later life, but this, coupled with all the other symptoms which I have experienced, made me determined to stop taking statins altogether some weeks ago. It took a while for me to begin to feel more like “my old self ” (a very healthy old self! I might say) who was able to walk perfectly well with no muscle pain whatsoever. I intend to tell my Doctor that I have stopped taking statins, and will be very interested to see what her reaction will be. Watch out for the usual reaction – which is to prescribe a different brand of statin. I made the mistake of agreeing to try that approach. They all did the same thing and eventually left me with a permanant problem. I will certainly let you know what the doctor says. Unfortunately, Atorvastatin was the second statin I was given; Simvastatin being the first, which gave me the most vivid nightmares making life intolerable, due to sleeplessness. It is only now, after taking statins myself, that I wonder if they were the cause of my husband’s personality changing completely following a triple by-pass. Prior to taking Simvastatin he was a caring, happy man who enjoyed life. Following the op. he became quite morose; unable to make decisions and not the man I knew. Maybe statins were to blame, or maybe not, as he was on a cocktail of drugs at the time. There certainly needs to be more honest information given to the public re. statins. I consider that we have had the wool pulled over our eyes for far too long by NICE. I have a polio leg, which caused me very little trouble until I had taken Simvastatin for about 3 years. At that point I started to get awful cramps and extra weakness in that leg. By sheer good luck I had remembered that statins could cause muscle problems – so I stopped for a bit. Things started to go right, but I thought it might have happened anyway, and I resumed my statins, and the trouble came back…. In all I stopped 3 times before I realised the truth. Even then, I just thought the statins were merely intensifying my problems – it took several months before I realised they were the sole cause of my problems! I am fully recovered, but unfortunately some people report continuing problems after giving up statins. I would try to exercise your legs as much as possible now you are free of statins (taking some sort of painkiller if necessary). I am convinced from what I have read here, and in Dr Kendrick’s book, that statins don’t offer enough gain for all the side effects – which can include severe muscle pains, mental confusion and memory loss, and an increased risk of diabetes! I hope you recover as completely as I did! Thank you so much for your assurances re. not taking statins . I thought long and hard before stopping them and, like you, stopped on a previous occasion and started again only to find the same symptons returning. The problems started quite gradually and I linked them to a previous injury (spiral fracture to my leg) but common sense won in the end and I now blame the statins. I have always been so healthy and too many problems reared their heads at the same time. I know the doctor’s explanation would inevitably be “old age” for some of them, but that doesn’t rest easy with me. I am due to have a leg splint fitted on the 20th and will go along with that in the hope that it may help me to at least walk in a straight line until my leg strengthens up!! One other thing that concerned me whilst on statins was how miserable I felt all the time (which isn’t me) and since being off the statins it is as though a veil has been lifted and I feel much better for it. I hope that I do regain full strength in the end, and tthank you so much for sharing your experiences with me. I will certainly take your advice and exercise my legs as much as possible. I am so pleased that things worked out for you eventually. I recall on another blog that you used a specific anti-inflammatory to help you recover. I have forgotten the name before I last saw my physician for three month check. Can you tell me once again? I am so glad for your complete recovery. I do feel better, but still suffer with cramps and leg pain. On my recent doctor’s visit (my GP retired), I told him I stopped statins because I truly believed the side effects were unacceptable and felt that cholesterol lowering was not the answer. He tried so hard to convince me that my pain came from a back injury. I told him I HAVE NEVER HAD A BACK INJURY. Then he tried to blame my current state on something else. Nonsense all of it. I was on a fibrate for four years. Actually, that was the beginning of my leg pain. When my pharmacist pointed out that fibrates can cause leg pain, I told my GP and he begrudgingly checked my CK numbers (which were normal) and put me on Simvastatin. My cholesterol levels plummeted even more (to 121) and I felt worse than ever. After so many years on statins, someone told me to go to spacedoc.net. The first books I read were authored by Dr. Duane Graveline, followed my Dr. Kendrick’s fine book, “The Great Cholesterol Con”. I weaned off Simvastatin beginning July, 2013. I am better but still have residual pain that I fight every day. Some days are better than others. 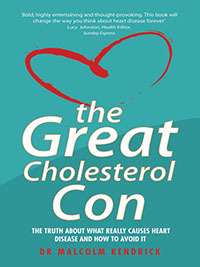 The whole idea of cholesterol lowering by prescription is unhealthy and damaging. Dr. Kendrick is right. Statins will truly add 15 years to your life by making you feel 15 years older than your chronological age. I can only say that all things happen for a reason. My insistence on finding a reason for my continued pain was an obsession to say the least. It took years for me to understand what was at play here. In the U.S., there are advertisements from law firms where pharmaceutical companies are getting sued in class action lawsuits for so many prescription drugs, it is scary. The time will come when the truth will surface. People in the U.S. are already avoiding sugar and many unhealthy foods. There seems to be some kind of “movement” to educate people about the common sense approach to health. That means whole foods, real foods, healthy choices. And the American Heart Association is still lagging so far behind those who see them for what they are… that they have become useless. They just don’t know it yet or will not admit their own flawed science. Pity! Since only my polio leg was affected, I get the impression that statins may zoom in on any existing problem area – in your case your bad fracture. This can be particularly insidious, because it distracts both patient and doctor (I imagine) from the true cause. In my case, I thought I might be getting Post Polio Syndrome, and did, in fact, go to see a specialist before I discovered the real cause myself! Yes, indeed I mentioned that I took diclofenac to reduce the pain to a level where it was reasonable to exercise as I recovered from the statins. On reflection, I think it probably doesn’t matter so much what you take to relieve the pain, so long as you get to exercise those muscles! I mentioned diclofenac, because this seemed to work well for me, and also seemed to stop the cramps (for the most part) – but whatever lets you exercise. I am reasonably active, and a lot of the people I know, are also active, which may explain why I stumbled across so many people who had had also had statin problems. The following are relevant links. CRESTOR (rosuvastatin) like BAYCOL (cerivastatin – removed from market) should never have been authorized. I wouldn’t be surprised if your doctor was completely nonplussed. I suspect she’ll know the truth surrounding statins but will equally have to “protect” her own interests. Obeying NICE is part of that remit. My maxim regarding doctors’ these days is: it’s only their job, but it’s my health! The two should be aligned but unfortunately they’re not. Anyone reading Dr K’s blog or books already knows this. In the meantime you should be trying to mitigate the damage the statins have done to your system. Taking a good quality CoQ10 supplement (I’ve read one or two studies about the hydrosoluble ones) and a bioavailable magnesium supplement (eg citrate, orotate etc) should help. Investigate upping your potassium as well. I’d also try having a good old occasional soak in Epsom salts or using magnesium oil for transdermal absorption (particularly where your pains are) as well as eating plenty of good old fashioned real food, eg, plenty of eggs, liver, butter etc – exactly what you’re told to limit! Don’t skimp on the (Celtic) salt either. And above all take control and don’t worry. According to the guidelines, everyone’s borderline something these days! Steve, it is being a member of the ‘borderline something(s)’ that got me into the revolving door system of our present day prophylactic NHS system. I thought my GP was assisting me in warding off the impending nasties of aging, by encouraging me to take an ever increasing list of drugs, and following potty diet recommendations, all of which proved to make me so ill. I have shown that by removing the drugs, ignoring the NHS dietary recommendations, and keeping the medics at arms length, unless I actually have symptoms of something or other, is the winning combination for myself at least. But, the ever spiralling number of people being pushed into the ‘borderline something’ category is causing havoc in our care system, because these very ‘treatments’ are actually making reasonably fit people into actually very ill people, who then are having difficulty accessing real care….except for the ubiquitous “repeat prescription” system that can be run by robots! As an aside, I have now had 2 occasions this year where I have had to intervene to get care for elderly relatives living over 300 miles away. They were being passed from pillar to post, getting weaker and weaker, and generally put to the bottom of the system. Being poorly, they were subjected to endless and exhausting interrogation by phone, and thus probably not getting their message across clearly….because they were poorly. (Doh..!….you know, entering a spiralling down situation, as poorly people do). The 2nd ocassion required an expensive 999 call-out, which could have, indeed should have, been nipped in the bud, if a decent response system by local GPs had been available. As we languish in a cesspool of immorality, should it take a bl…y revolution to get us to where care for the sick, housing for all and appropriate education, are the norms? I reckon I will see fairies at the bottom of the garden before that happens. Thank you for your comments re statins. From the comments I have received I feel that I have done the right thing in stopping them. I was very interested in the supplements which you mentioned and will certainly look into taking something like that, once I track them down. A soak in epsom salts is a bit of a no-no at the moment, or at least until my legs gain some strength and enable me to get into, and out of, the bath again, but I will certainly do this at a later date. I am so glad that I finally decided to take control, but had to smile at the point you made i.e. “everone’s borderline something these days”!. How true. A soak in epsom salts is a bit of a no-no at the moment, or at least until my legs gain some strength and enable me to get into, and out of, the bath again, but I will certainly do this at a later date. Just get a bowl and soak your feet a few times a week. You’ll be amazed how much it’ll help. Enter “Zechstein” into Amazon and it’ll bring up the best form to use. Thank you all for your further comments regarding my current problems. I visited my doctor yesterday and told her that I had discontinued using statins a short time ago. As we anticipated, she insisted that statins had been proven to reduce the risk of heart attacks but, of course “all drugs had side-effects” !! However. she didn’t try to encourage me to carry on taking them or change to another one, which I found greatly encouraging. I almost felt as though she agreed with me, but couldn’t say so. I agree with you David, about the possibility that statins somehow seek out your weakest parts and attack them and it takes some time for us to realise that. I will certainly Google Zwechstein Steve, and try the foot soaks with epsom salts too. ……………..statins had been proven to reduce the risk of heart attacks……..
Sylvia, well done and best wishes. If it’s any comfort I ditched statins about 15 years ago. TC hovers around 7-8. Clearly ditching the drugs didn’t result in instant death. I am really, as a researcher in aerospace materials, one of the strongest believers in natural science as a means of understanding our world in a comprehensive way and possibly improve on our interference with nature. When it comes to medicine I was earlier a believer that it also belonged as a part of the natural scientific body but today I only find scientific fraud and where ‘institutions’ like NICE evidently work as coverup frameworks for the delusions involved. The absolutely worst thing for me today is that the same thing now happes with my view on the agricultural industry where I also until rather recently was ignorant of what was going on. What I am now starting to grasp about the genetically engineered (GE) crops blows my earlier naive opinions away. As with medicine i seems to be just based on sophisticated fraud. It is really disgusting for me to find this out on your own sinceI really want to keep my faith in our society on a fundamental level. I have just ordered a new book which should uncover how this GE came about 20 years ago and how the fraud was covered up. I know how you feel. So far I’ve experienced this with Statins, Alzheimers, Vaccination and GMO. Oh, and currently low level microwave from phones. Sorry Malcolm, off topic, Goran, GE/GMO the more you look the more disconcerting it gets, people are directed to believe it’s a feed the world initiative. It has very little to do with feed the world. As the pharmaceutical industry has cartelised all curative drugs the ongoing attempt by GMO companies is to cartelise all agribusiness. It may be an enlightening read but you won’t feel better for reading it. Be careful with what you believe when it comes to Dr Mercola Prof. He has made some truly awful videos. I read your to articles and like you, am a great admirer of Dr. Mercola. The sad state of affairs in the U.S. is all too common. Judges ignore what they choose to even on a Federal level. At other times, they simply “legislate” from the bench. This issue should be resolved by congressional intervention. The courts are there to “interpret” the law, not to make it. The system does not work as it should. It is quite sad when a Federal Judge ignores due diligence. I have read about these GE for quite some time and there are groups who are fighting this issue tooth and nail. As always, the reason for these GE’s as if you did not already know, is to ensure more plentiful crops and, therefore, more money for the growers. On a positive note, I see that there is a growing trend among people in the U.S. who care about the future of their offspring. One such example can be found in the ever growing grocery store chain called The Whole Foods Grocery stores. They do not purchase any GE agricultural products and those they do accept within their stores have to meet those criteria. These stores will be outnumbering the large grocery store chains soon. I hope it sends a message to Congress and the courts that people are not stupid and are not going to put up with it any longer. When that message is heard loud and clear, change will come. It is not as quick as we would like I know, but it sometimes takes a few good men and women to start a revolution in thinking. Thanks so much for this post as it was very informative and useful information. I am beginning to wonder about the fate of our three branches of government and whether they are truly checks and balances. It is so complicated. The FDA has become a farce. It may seem that you are banging your head against a brick wall, but you are not. I had one GP who wouldn’t listen to my HFLC philosophy. (My T2DM out of control and no help from the NHS), so I changed her to one that was 3 mths prior to retirement. My chol was over 5, but ratio was perfection. She informed me that the chol/death rate was the reverse we are told (without me saying a word) and even though the computer told her to put me on a statin, she couldn’t recommend it. I wouldn’t have accepted a statin if she had insisted. She had gleaned this from your arguments in the BMJ. You are getting your message across, slowly but surely. You are making a difference, without a doubt. ( My history? – 6 1/2 stone weight loss, HbA1c reduced from 66 to 33 by LCHF). I daily look at myself in the mirror with disbelief. Svelte, lean, glamorous. First time since I was 20. Shall I ditch the Metformin? Can’t decide. No matter how well my T2 is controlled I still have the metabolic disorder. Sick of pills, but I imbibe a whole lot of vitamin pills, what is another pill? This excellent GP is now retired, what do I do now? Will the young, newly minted replacement have a open mind? I reckon it’s 50/50. I so agree. When you have been in the trenches for as long as Dr. Kendrick and his like minded scientists and physicians, it seems the wheels of justice turn very slowly. Yet, those of us who have only recently begun to see the light can also see much hope and progress. There is no doubt that these great minds have made a difference. And I hope they know how valuable and cherished their work really is. I hope you take the time to pick your next GP wisely. Mine, too has an open mind with regard to medicines and agreed with me as to how I feel about the medications I have ditched. He is a fine doctor. Mary, in the last month I have heard from 3 family members ( all living many miles away from one another), who are in the process of ditching their long term, commonly prescribed meds, as often discussed on this blog. Maybe I have sown a few seeds, ( I am a bit of a bore regarding foods and drugs), but it is nice to know that they are all doing so under the umbrella of their GPs, who are certainly more inclined than mine ever was, to consider the prospect of their patients living healthy and drug-free. I think we may be winning! Power to the people! (with thanks to the wonderful academics on this blog, who have enlightened us). Liz, your story is such an inspiration. I no longer take any medications. I was fortunate enough to be seen by a knowledgeable, sensitive consultant endocrinologist, who listened intently to my reasons for wanting to discontinue all meds, and he sort of gave me his blessing, ( as best he could, within the stifling constraints of the NHS) ….but with one proviso….Please keep taking metformin, at least 500mg ( I was taking 2g at the time, along with a shed-ful of other things). I agreed, but within a few weeks my personal research bandwagon turned to Metformin….and then that got the chop too! Unfortunately, I have been unsuccessful in finding those papers which I read 2 years ago, pointing out the detriments of metformin. However, I intend to stay away from metformin for reasons I have forgotten. ( statin induced amnesia, I call it ). I have recently spoken to someone who voiced the same opinion, not knowing that I had a personal interest in the drug. I did not determine his reasons (and after 17 years of usage), for discontinuation, other than raising his eyebrows regarding the attributed side effects he has now discovered. Can any bloggers out there help me with finding this information again? I would be much obliged. I was taking metformin for many years but it finally caught me with diarrhoea. From the MHRA DAP it appears that a third+ of all ARs are of this type. Some months later tried a small (500mg) dose with an explosive response. Unfortunately other drugs have the same effect; repeated twice to confirm. Thanks Mike. I look back on the days when I was taking 2g of metformin. By night fall I was devouring the lovely aniseed Gaviscon in large measure..(ultimately changed to a less tasty cheepo verson). Now was it Simvastatin causing such discomfort, or Metformin?…how will we ever know.. And a great ‘get out of jail card’ for both drugs…’not me guv, its the other bloke’! But what is clear…without either, I no longer need antacids. My point about metformin research was that I am sure I read quite ominous reports regarding its systemic safety. I just can’t find the papers again….am I getting paranoid?…..have they been removed from the internet? Da da da da…..da da da da. Are our blogs being monitored? The Institutions that are supposed to protect the general public from ineffective and dangerous drugs (FDA, EMA, MHRA and other national bodies) are in fact protecting Big Pharma and their ineffective and dangerous drugs! They, the institutions/agencies, are both obfuscating and deliberately obstructive to any attempt to get the truth about drugs. Prof. Gotzsche (Deadly Medicines and Organized Crime;Chapter 11) gives many details of this. Post-marketing pharmacovigilance was brought in to assist Big Pharma in getting new drugs to market more quickly, the concept being that working doctors would report any and all adverse reactions in their patients but studies have shown that <10% (in UK I suspect <1% as reporting is optional and they have many other mandatory forms to fill) actually do this. I personally wrote to the MHRA suggesting that there should be a black box warning on the data insert of every drug warning patients that there were potential adverse reactions and that these should be reported to the MHRA via the Yellow Card system by either the doctor or the patient. Instructions on how to report should also be included. The response was that the email would be sent to the appropriate department. Since then NOTHING. Mike, there is something wrong with your link to the petition. The petition may be closed? I certainly signed. Here it is: https://www.change.org/p/home-office-department-of-health-the-national-institute-of-clinical-excellence-nice-to-publish-all-drug-trial-test-results . Unfortunately, with only 23 supporters at the moment (including me), she has a long way to go to achieve the desired objective. Both the editor of the BMJ and the Chair of the Commons Health Committee have already called for publication of the data, without success. I think the original link must have been closed; I certainly copied it when I supported the petition. Anyway I have added my name again. I’ve just added my name to the petition, but that means there are still only 77 supporters! It needs to be more widely disseminated. Accepting your convincing arguments against the Cholesterol hypothesis, is there an upper Cholesterol limit at which you balk? Mine has recently increased from 7.3 to 7.5. At 75, my relative plucked up the courage to ask her GP if she could come off the statins that she has been taking for more years than I care to remember. The GP just said “yes, if that’s what you want, but let’s see what your cholesterol is in 8 week’s time” I ask myself “why?”, and I wonder what the GP’s top line actually is. It should not come into the equation for a 75 year old female! End of. Can anyone give me any evidence that at the age of 75 and plus that there is any benefit of taking statins for men or women to compare against the probability of serious adverse reactions? The epidemic of Chronic/congestive heart failure (CHF) is apparently increasing along with Alzheimer’s, Parkinson’s, ALS, autoimmune diseases, etc, etc. but in the interests of “saving” 3 lives per 1000 (HPS) the brain-washed continue to promote statins at higher and higher doses. 7.5 sounds pretty low to me. For the past couple of years mine has bounced between about 9 and 10. And, my GP isn’t bothered either! I am increasingly convinced that NICE has no clue about statistics. And yet they inflict flawed cost-benefit analyses on doctors and the general public (such as my father, now with frontotemporal dementia). The statin enthusiasts rely on a statistical manoeuvre called ‘relative risk’. I had never heard of this during my statistics degree course so I looked it up in Wikipedia. Try it. You will find that it’s only used for clinical trial data … or, going back into the history of the article, epidemiological data. Maybe it’s pure coincidence that the UK’s biggest statin enthusiast is a professor of epidemiology … who recently admitted he and his team had never looked at the adverse effects of statins. I mention this because the NICE statin guidelines are based entirely on that analysis, without any data to back it up. My recommendation to the Commons Health Select Committee is that NICE should be scrapped: http://innereye.eu/obhiblog/wp-content/uploads/2015/02/Letter_Wollaston_Feb_2015.pdf . No reply so far. Maybe they are still in shock. You might want to watch the film I’ve made about what I found out after my father was diagnosed with dementia. You’ll find the YouTube link in my letter. Those we interviewed include Dr Stephanie Seneff, Senior Research Scientist at MIT. She had concluded already in 2009 that statins and a low fat diet could cause Alzheimer’s. I just get impressed about the seriousness, the magnitude and depth of your fighting spirit, as I am with Malcolm’s, after having watched your letter and the trailer of your film. For sure I will watch your full movie. We need a lot more of guys like you. In Sweden we have got a pretty strong LCHF grass root movement which may put a pressure from beneath to make things change – at least that is my present hope. The doctor recently quit his GP job to work full time trying to promote the LCHF movement instead. He might survive and he does not need to prescribe any more statins anyway. Many thanks for your kind comments Professor Sjôberg. I merely follow the values taught to me by my parents. I share your hope that the LCHF movement will help to prevent the disease (sometimes diagnosed as ‘regulatory capture’) which seems to have gripped medicine lately. We have elections coming up in the UK at the beginning of May. Perhaps it is a good moment for a social media campaign to ban statins for primary prevention … . This opinion piece by John Abramson was published yesterday in the Pharmaceutical Journal: http://www.pharmaceutical-journal.com/opinion/comment/prescribing-statins-time-to-rein-it-in/20068145.fullarticle?adfesuccess=1 . Unfortunately, I learned from DietDoctor’s Facebook post earlier this week that in Sweden, your latest statin guidance is even more nonsensical than in the UK: http://www.dietdoctor.com/should-you-be-on-statins . “Under the new guidelines, statins should be used only when the overall risk of death from cardiovascular disease within 10 years is higher than 5%, no matter what your cholesterol level is … “. The corresponding NICE percentage is now 10%, as Dr Kendrick says in his article. The most statistically valid analysis I have seen looks at the number of patients who need to be treated before 1 person benefits, and compares it with the number of patients who need to be treated before 1 person is harmed. Here is the result of that analysis for using statins in primary prevention of heart disease, taking into account the risk of diabetes and muscle damage: http://www.thennt.com/nnt/statins-for-heart-disease-prevention-without-prior-heart-disease/ . That conclusion of ‘No benefit’ is even without taking into account the otherwise inexplicable rise in cataract operations in the West or the risk of Parkinson’s in the report mentioned above (or dementia and other neurological problems) … not to mention depression, aggressive behaviour or suicide – all associated with low cholesterol. These would probably shift the NNT/NNH balance towards a ‘Caution: Harms > Benefits’ conclusion. Two recent studies published in the Expert Review of Clinical Pharmacology probably shift that balance even further towards that conclusion. One explains how ‘Statins stimulate atherosclerosis and heart failure’ http://informahealthcare.com/doi/abs/10.1586/17512433.2015.1011125 . The other explains ‘How statistical deception created the appearance that statins are safe and effective in primary and secondary prevention of cardiovascular disease’: http://www.ncbi.nlm.nih.gov/pubmed/25672965 . The latter notes that there is an underlying flaw in meta-analyses such as the one done by the CTT (which apparently impressed the Cochrane collaboration after its less-than-enthusiastic 2011 conclusions). By including data from trials done before 1 May 2004 (when the EU Clinical Trials Regulation came into force, following ethical problems with earlier trials), such meta-analyses include industry-funded trials. Any UK doctors who still take NICE guidance on statins seriously might want to read the patient information sheets for the statins they prescribe. Here, for example, is the one for Lipitor: http://www.mhra.gov.uk/home/groups/spcpil/documents/spcpil/con1409896533152.pdf . That means that, if the doctor prescribes Lipitor in any of these conditions, it isn’t the drug manufacturer who would be liable but the doctor (and not NICE, which only issues ‘guidance’). Oh, and if patients ‘have high levels of sugars and fats in [his/her] blood, are overweight and have high blood pressure’, “Your doctor will monitor you [for diabetes] while you are taking this medicine.” I gather over 1,000 US women who developed Type II diabetes while on Lipitor have claimed compensation so far: http://statin-diabetes-lawsuit.com/ . I am a member of UKIP (a much maligned party in my opinion), and I did try to raise the subject of statins with our health spokesperson, Louise Bours, but without success. I think the problem is that such issues can turn terribly toxic (sorry about the pun) because someone like Sir Rory would get filmed in a suitably imposing setting, explaining that these decisions could only be left with the experts, blah blah blah. The other parties would then argue that UKIP didn’t know what it was talking about. There does seem to be something of a revolt among actual patients. I know several who decided to stop their statins, and others who say they would never accept them. Likewise there seems to be an acceptance that saturated fat need no longer be avoided, even though the official advice hasn’t changed. I reckon nothing will change until the medical establishment feels its moral authority is being eroded from below. David, “UKIP (a much maligned party in my opinion)” It’s the same phenomenon, UKIP is a threat to a lot of long held and established sinecures, a lot of very comfy chairs. Consensus is not exclusive to science it also infests the entire political sphere. Sir Joe Bloggs has made a declaration in a political area, if you want to remain in the game of politics you mustn’t question him. Raising the statin question with UKIPs health spokesman, unless of course they are an eminent research cardiologist, would give the media another stick to beat them with. To stay in the game UKIP have already dropped the questioning of the NHS and fallen in line with the consensus: throw more money at it. How right you are. This money and status “crisis of lost integrity” is everywhere; medicine, politics, you name it and there it is. I think the point is that although statins are ultimately a political/criminal matter, they are superficially only a problem of medical science. Once we reach the point where it is accepted that statins are a political matter, the job is almost done! You are right – UKIP is questioning a lot of vested interests in the UK – which is the real reason why it is vilified. You are also right that sloppy consensus decisions get in all areas of public life. There are in fact so many issues that we could take up, that it really isn’t practical to attack them all in an election campaign. However, I think that if UKIP gets any real power over the NHS after the election, it will want to cut the NHS drugs bill, and it will be far more open to grass roots pressure – so protests about secret statin trials and experts who are nobbled by big pharma will be less likely to fall on deaf ears. consensus decisions get in all areas of public life. The “consensus” is not really a consensus, it is a consensus of a clique. The original guidelines by the NHBLI/AHA were a consensus of 8 Big Pharma KOLs plus an independent chairmain – fine example of what represents “consensus”. Yuck! In the medical ‘kingdom’ (or rather religion) of psychiatry there is an incredible long list of mental ‘disabilities’, the length of which must be considered as a joke if it was not for real, e.g. 40 % of all women put on psychopharmaca after diagnosis? If there was to be any reasonability in that list I think an evident mental disease should be added – DESD, The Deaf Ear Syndrome Disease. Though this could never happen as this would wipe out most of the medical establishment as insane and in need of strong medication. Yes I was well aware of the exponential increase in psychiatric definitions and the increase in SSRIs which in most cases are no better than a sugar pill. Big Pharma is very adept at creating new conditions for which their pills can be “used”. And very profitable it is too. Prof Gotzsche has a go at the in his book. Indeed, I have not received a reply and Parliament is due to be dissolved on Monday. However, this week the Select Committee published its report on the impact of physical activity and diet on health … without any particularly radical conclusions other than suggesting that it is “inexplicable and unacceptable that the NHS is now spending more on bariatric surgery for obesity than on a national roll-out of intensive lifestyle intervention programmes that were first shown to cut obesity and prevent diabetes over a decade ago”: http://www.publications.parliament.uk/pa/cm201415/cmselect/cmhealth/845/84508.htm . The Committee mentioned progress on introducing a traffic light food labelling scheme, which might be good if only Public Health England knew what a healthy diet actually is, and that its ‘eat well plate’ isn’t it! It also emphasised the importance of physical activity. Or in other words it is people’s own fault if they are fat, not the Government’s dietary advice. Maybe another part of the problem is party political funding, especially at election time. As far as I can tell, the Conservatives and UKIP are reliant on funding from wealthy individual and corporate donors, Labour is reliant on funding from trade unions, and the Lib Dems are reliant on individual & small business donors. The chances that any of these funding sources have an interest in preserving the status quo are quite high. In addition, hardly any of the MPs in this parliament have a science background: http://www.independent.co.uk/news/uk/politics/only-scientist-in-commons-alarmed-at-mps-ignorance-2041677.html . In any case, MPs have to deal with such a diverse range of topics that they are unlikely to feel knowledgeable enough to criticise regulators on a topic as specialised as statins. It is a book by Thomas N. Seyfried who is a professor at Boston College and who has conducted serious research for many, many years about the energy metabolism, and especially in the the mitochondria, of cancer cells. This 2012 book is “Cancer as a Metabolic Disease” and is a profound a;lternative on alternative medical treatments on cancer. The only bad thing with the book was the price tag but such often come with serious books. Christofferson, Travis (2014-10-26). Tripping Over the Truth: The Metabolic Theory of Cancer . . Kindle Edition. Free to read for Kindle subscribers £7.50 Kindle edition to buy. This is a layicised review of Seyfried’s book. Extract from: Christofferson, Travis (2014-10-26). Tripping Over the Truth: The Metabolic Theory of Cancer . . Kindle Edition. Now there is an interesting but different view of the cause of cancer and possibly to a treatment. The ketogenic diet may hold lessons for the treatment of cancer as well as diabetes. As promised I have now watched your full movie and am duly impressed. The funny thing is that your film actually summarise what I have learnt more and more deeply during my six years of LCHF way of life now and at the same time having tried to get an understanding of the physiology involved. Our views seem to be almost identical although I am perhaps a stronger believer that a paradigm shift can only come about through a pressure from below. This is really a devastating insight I must admit. So – thank you for sharing your film with all of us. Obhi, your excellent film has covered many areas of interest to those of us who follow Dr Kendrick’s blogs. Sad to say that it highlights the reasons why so many of us now distrust the NHS, the food industry, and politicians. I will once again reiterate my concerns that if eminent, articulate people like yourself fail to get responses regarding these terrible situations, where does my minor stake fit into the scheme? I will keep adding to the numbers pushing at it from below, whilst keeping my fingers tightly crossed. As the lack of response to your efforts has demonstrated…..getting access to those at the top is falling on deaf ears…..but please keep trying. Jennifer, it was indeed a fine presentation but as you say, how do us mere mortals participate. You have to have the relevant qualification to be considered for gang membership, passing that stage the most important prerequisite is you agree with it’s policy. There is of course a large associate membership who get in just on policy agreement. Useful, but well connected, idiots. Thank you so much for watching the film and for your kind comments, Jennifer. I doubt I am eminent enough to merit your compliment, though. My wife and I were simply so shocked by what we found out after looking into this murky area for my father that we felt we had to do what we could to avoid others falling into the same trap of Government-promoted ignorance as my father and we did. You will understand that we are kicking ourselves for ever having reminded my father to take his statins or indeed any other medication he was on, without having looked into their side effects. As I suggest in my reply to Professor Sjöberg above, the more that you and others share our film and other films/articles like it online, the more likely it is that things will change. We have compiled a collection on the film website: http://innereye.eu/nuts/related-films/ . I’d be happy to know if there are others we should add to the list. Today’s age of ‘digital revelation’ has given us unprecedented access to information which was previously unavailable to us. The public reaction to what this sort of transparency reveals will determine whether or not anyone at the top will listen. Maybe the current election campaign in the UK is a good moment for someone (anyone) to launch a social media campaign to ban statins and other cholesterol-lowering medication, at least in primary prevention of heart disease, because the benefits do not appear to outweigh the adverse effects?